Targeted: Bangsar Shopping Centre is among the selected investment assets targeted by Ambang Sehati Sdn Bhd. PETALING JAYA: Property development company Bandar Raya Developments Bhd (BRDB) has announced a related-party transaction involving its major shareholder Ambang Sehati Sdn Bhd, which has proposed to acquire selected investment assets including The Bangsar Shopping Centre, Menara BRDB, CapSquare Retail Centre and Permas Jusco Mall. The BRDB board received the letter from Ambang Sehati, which holds 19% interest in the property developer, on Monday to acquire the assets to “enable the group to monetise these assets and achieve a more efficient utilisation of its capital”, drawing the board's attention to the company's shares which had been trading at a significant discount to its net asset value, said the company in an announcement to Bursa Malaysia. Under the plan, it has proposed to acquire CapSquare Retail Centre, which is currently held by BRDB's wholly-owned subsidiary Capital Square Sdn Bhd; Permas Jusco Mall, owned by BRDB's 99.74%-owned subsidiary Permas Jaya Sdn Bhd; and BRDB's entire 100% equity interest in BR Property Holdings Sdn Bhd, which owns The Bangsar Shopping Centre and Menara BRDB. BRDB has up to Sept 19 to revert with its decision on the proposed acquisition by Ambang Sehati that would be satisfied fully in cash. The company proposed to acquire these assets collectively, and not individually or any part thereof, at a purchase consideration to be based on the fair value that would be determined by independent valuers to be appointed based on mutual agreement. BRDB had appointed CIMB Investment Bank Bhd as its main adviser to evaluate the proposed acquisition from Ambang Sehati. The company said its board (except for Datuk Mohamed Moiz Jabir Mohamed Ali Moiz, who is the chairman of the board, with deemed interests in the proposed acquisition by virtue of his substantial shareholding in Ambang Sehati) would deliberate on the proposed acquisition and decide on the next course of action with advice from the main adviser. Accordingly, further announcement would be made in due course. BRDB is known for its development of Bukit Bandaraya in Bangsar, Kuala Lumpur. It also has developments in other areas in the Klang Valley, the Kuala Lumpur city centre in particular, and in Johor. KUALA LUMPUR: Datuk Mohamed Moiz Jabir Mohamed Ali Moiz, chairman of Bandar Raya Developments Bhd (BRDB), has proposed to buy three properties from the group for a yet to be determined cash amount. Moiz, through Ambang Sehati Sdn Bhd, plans to buy The Bangsar Shopping Centre and Menara BRDB, CapSquare Retail Centre, and Permas Jusco Mall. The properties are valued at RM942.37 million based on BRDB's latest annual report. Ambang, which holds 18.88 per cent of BRDB, will buy the assets based on fair value as determined by an independent valuer to be mutually agreed. "Ambang Sehati believes that this would enable the group to monetise these assets and achieve a more efficient utilisation of its capital," BRDB said in its statement to Bursa Malaysia yesterday. BRDB's board will have to decide by September 19. It has hired CIMB Investment Bank to evaluate the deal. Shares of BRDB fell 1 sen to RM2.32 yesterday. Bandar Raya Developments Bhd, a Malaysian property developer, rose the most in two weeks in Kuala Lumpur trading after a major shareholder proposed buying some of its malls and offices. The stock gained 1.7 percent to RM2.36 at 9:15 a.m. local time, set for its largest increase since Aug. 19. 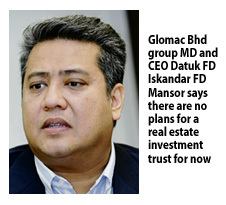 KUALA LUMPUR: Glomac Bhd, a medium-sized property outfit, may invest overseas to diversify earnings if it gets projects with good returns. Group managing director and chief executive officer Datuk FD Iskandar FD Mansor said the company was at one point looking at India and Vietnam but put on hold plans to focus on Malaysia. "There are still a lot of things we can do here. We will keep our options open for overseas expansion," he said in an interview with Business Times recently. Glomac's first foray overseas was Australia in 2006, when it bought 380, Lonsdale Street, in Melbourne for A$30.5 million (RM82.4 million). This was through its unit, Glomac Australia Pty Ltd and partner Victoria Investments & Properties Pty Ltd. The Lonsdale property encompasses a commercial building and a seven-storey carpark complex, with 445 bays offering 8 per cent rental yields. The building is now worth more than A$45 million. In 2008, Glomac ventured into Thailand and currently has a 600,000 sq ft warehouse near the Bangna-Trad highway in the Samutprakarn province in Bangkok. The warehouse, which is 49 per cent owned by Glomac and 51 per cent by its partner, Warehouse Asia Alliance Company Ltd, a leading Thai company in warehousing and logistics services, was built for RM125 million. It is now worth around RM180 million. Iskandar said although Glomac is not seriously looking at property projects overseas, it is mulling redeveloping Lonsdale Street to ride on demand for commercial properties in Melbourne. "We are looking at potential redevelopment of the property as the market for commercial assets is very hot currently," Iskandar said. Iskandar said long term plans include building its investment portfolio to include properties that provide a good yield. But he ruled out the possibility of launching a real estate investment fund (REIT) for now. "We were keen three years ago but to launch a REIT, you need assets worth RM500 million to RM600 million. "We will look at investing in properties that give good recurring income. What is hot today are retail malls," he said. Glomac had in its portfolio investment properties worth about RM200 million but sold most of them in recent years to focus on property development. PETALING JAYA: Dijaya Corp Bhd has entered into a conditional sale and purchase agreement with Taiyo Resort (KL) Bhd to acquire five parcels of freehold land in Mukim Semenyih, Ulu Langat, Selangor, measuring approximately 80.33ha for RM228mil cash. In a filing with Bursa Malaysia yesterday, Dijaya said the agreement with Taiyo Resort was entered by its wholly owned subsidiary, Tropicana City Service Suites Sdn Bhd (TCSS). The parcels of land are currently held under the operations of Kajang Hill Golf Club, it added. Dijaya said the land would be transformed into a mixed development consisting of landed houses, condominiums, apartments and shop offices with an expected gross development value of about RM2bil. “The development, known as Tropicana Kajang, will be another future revenue generator for the group and shall contribute positively to its financial performance,” it said in a separate statement. Dijaya said the freehold land had an upside potential in terms of capital appreciation because of the increasing demand for residential and commercial properties in Kajang, as seen in other developments such as Nadayu 92, Tiara Residence, Ramal Villa, Twin Palm and Jade Hills, just to name a few. “With increasing population and expanding residential properties in and around Kajang, the proposed development of commercial properties will cater to the rising demand for office and retail spaces. “Furthermore, the proposed Kajang-Sungai Buloh MY Rapid Transit project will enhance the investment potential of Kajang, presenting a greater opportunity to property investors,” it said. Group chief executive officer Tan Sri Danny Tan Chee Sing said the group was continuously acquiring sizeable land-banks with good development potential in strategic locations. “The land deal provides an opportunity for the group to introduce more development in Kajang with quality and prestige synonymous with our Tropicana brand,” he said. Dijaya said the purchase price was arrived at on a willing-buyer, willing-seller basis after several considerations including the reasonably low land cost of RM26.36 per sq ft which will enable TCSS to price its proposed development competitively and with reasonable margins. On the financing for the purchase, Dijaya said it would be funded through internally funds and/or bank borrowings. “The exact mix of internally generated funds and bank borrowings will be determined by the management of the company at a later stage, after taking into consideration Dijaya Corp and its subsidiaries' gearing level, interest costs and internal cash requirements for its business operations,” it said. The group's net gearing is expected to rise to 0.22 times post-land acquisition assuming about RM114mil, representing approximately 50% of the purchase price, is financed via borrowings. As at Dec 31, 2010, Dijaya was in a net cash position. KUALA LUMPUR: Dijaya Corp Bhd, a property developer, has agreed to buy five parcels of freehold land in Kajang, measuring about 80.4ha (198.5 acres), for RM228 million. The land will then be transformed into Tropicana Kajang, a mixed development project, comprising landed homes, condomimiums, apartments, and shop offices with an expected gross development value of RM2 billion. "The group is continuously acquiring sizeable land banks with good development potential in strategic locations. "Today's land deal provides an opportunity for the group to introduce more development in Kajang with the quality and prestige synonymous with our Tropicana brand," said chief executive officer Tan Sri Danny Tan Chee Sing in a statement. According to the company's statement, these freehold land have an upside potential in terms of capital appreciation, partly because of the increasing demand for residential and commercial properties in Kajang. The land are also located in a suburban area with close proximity to other popular areas such as Serdang, Mahkota Cheras and Bandar Sungai Long. Kajang is served by numerous highways, such as the Kajang SILK Highway, that enable convenient access to neighbouring townships. In addition, the existing terrain of Kajang Hill Golf Course provides a readily available landscaping that will enhance the attraction of Dijaya's proposed developments. "With increasing population and expanding residential development in Kajang areas, the proposed development of commercial properties here will cater to a rising demand for office and retail spaces." "Furthermore, the proposed Kajang-Sungai Buloh MRT project will enhance the investment potential of Kajang presenting a great opportunity to investors," said the company in its statement.